Last week the NNS Steering Committee learned that, after further review by the city attorney’s office, the city has determined that Edgewood’s current Master Plan not only prohibits the playing of games, but also prohibits the installation of lights. This has been the position of No New Stadium all along and we are heartened by the city’s decision to enforce these limits. We have attached that letter sent by the Office of the City Attorney to Edgewood’s representative, along with a Notice of Violation from the city to Edgewood regarding their illegal use of the site. While there may be additional information we don’t have at this point, our current understanding of the situation is that the city has asked Edgewood to return to the Master Plan amendment process. We will keep you informed. The DMNA Council recently agreed to participate in conversations with EHS Board of Trustee members within a structured, facilitated format. We appreciate DMNA’s willingness to engage and its continued advocacy in opposition to the stadium. While we have been characterized in Edgewood’s literature as a “small but vocal group, a handful of neighbors… attempting to interfere” that is not what we are or who we are. We are an increasingly large group of Dudgeon-Monroe citizens who, pressed by the aggressive efforts of Edgewood High School, have been diligent and tireless in researching every aspect of the effects a stadium would have on our lives, our environment, our domestic and our financial well-being. We have established a factual and scientific basis for our deep concerns. Our survey and mailing list confirm that there are more than 300 neighbors now actively engaged in opposing the stadium. Our numbers are growing, as is our strength. The stadium is not right for our neighborhood (or for any residential neighborhood) because it would destroy the livability of our homes: noise, light, traffic, pre- and post event disruption and property devaluation would certainly occur. The proposed stadium is simply too close to residences. The time has come for neighbors and No New Stadium to develop their own legal strategy and have an advocate to communicate our legal arguments to the city. Visit the No New Stadium GoFundMe! page to donate. We thank you for staying informed and for continuing to be heard. Your letters to the Plan Commission and to the media, your readiness to testify should hearings or open meetings occur, your conversations with you neighbors sharing insights and ideas… all that you do magnifies the efforts of the Steering Committee beyond measure. Our commitment to our community and the preservation of our natural environment is reflected in support from Vilas neighbors, Friends of Lake Wingra and Friends of the Park and Pleasure Drive. Our values intersect and mirror those of other civic organizations, as stated in the missions of The Monroe Street Commercial Plan, the Arboretum, Imagine Madison, Madison Urban Design Commission and all those who understand that neighborhoods are the building blocks of our city. Under every roof in our neighborhood is a unique family, a story, a history of long lives or the beginning of a new story just unfolding. We are right to protect one another. Continue to Stand Strong with NNS! We will keep you and all of our supporters apprised of any new developments. Watch for updates and stay with us on important changes! MADISON, Wis - We’ve not taken a position on the desire by Edgewood High School to expand its outdoor athletic field on Monroe Street. We’ve been trying to keep an open mind as school officials and neighborhood residents opposed to the expansion plans try to work things out. But boy, Edgewood sure isn’t making it easy. We were not aware the city had told the school months ago it could not play formal games on the field without changing the school’s Master Plan. Well, apparently there was a soccer game played on the field earlier this week and the city issued a notice of violation to school officials. There’s no fine connected. And we understand school officials are receiving legal advice that differs from the city’s interpretation of what’s allowed. But at a time when good faith efforts to work with neighbors is awfully important, that sure seems like a strange way to show good faith. Again, our minds are open. But this doesn’t help. A private Madison high school that wants to revamp its athletic field for competitions over neighborhood opposition will play games on the field this spring despite city officials telling the school it can’t. Edgewood High School held a girls soccer match Tuesday afternoon at its Goodman Athletic Field, with additional boys and girls games scheduled through May. But Madison officials told the school late last year that holding any athletic competitions would violate the school’s Master Plan, which allows only team practices and gym classes on the field. The Near West Side school — which wants to turn the field into a stadium for football games amid fierce neighborhood resistance — has disagreed with the city’s position. City officials watched Tuesday’s game and will issue a “notice of violation” for that competition and for any other matches played on the field until Edgewood’s Master Plan is changed, said Matt Tucker, the city’s zoning administrator. “Our opinion hasn’t changed,” he said Wednesday. Michael Elliott, Edgewood’s president, said he was unavailable for an interview Wednesday. But in an email, he said Madison officials are treating the private school differently than the city’s public schools despite having the same zoning. “We do not believe the city has the legal right to treat us differently and believe we have no option but to continue our 90-year history of hosting both Edgewood and outside community activities at our campus,” he said. In a Nov. 14 letter, an attorney representing Edgewood said the school could play games on the field since it has historically used it for them, and Edgewood’s Master Plan and the city’s zoning ordinance for schools allow for historical uses to continue. While Tucker said his office can continue to issue violation notices for each game played on Edgewood’s field, he can’t issue fines or other penalties. Enforcement of any violations would come from the City Attorney’s Office. Edgewood can appeal the violations to the Zoning Board of Appeals, said City Attorney Michael May. If appeals fail or the school’s Master Plan isn’t amended, the city could seek a court order to compel the school to stop hosting sports competitions on its field, he said. Edgewood High School proposed last year to amend its Master Plan to build a $1 million stadium with 1,200 seats, lights, amplified sound, a team room and ticket booth to play night football games on its state-of-the-art artificial surface field and track. Many residents have opposed plans to bring football games to Edgewood, saying the changes would disrupt their normally quiet evenings with loud noise, light pollution and increased traffic. The school has said the changes are needed to play football games on its campus for the first time in about 20 years. The Madison City Council would have needed to approve any change to the Master Plan. But the school said in February it would abandon those plans, instead opting to only build lights and a sound system. That decision wouldn’t require City Council approval and would only need to adhere to city ordinances. The move was criticized by area residents and opposition groups, like No New Stadium, who said it was a way to undermine the City Council and public comment process. School officials said earlier this month they’d delay the light and sound improvements until April 15 and form an ad hoc committee to work with neighborhood residents. But Rachel Fields, vice president of the Dudgeon-Monroe Neighborhood Association, said those meetings won’t be able to start until after April 15. She said the association has agreed to participate in the committee but was still finalizing requirements with Edgewood and hasn’t been told whether the school would further delay work. It’s unclear when or if Edgewood intends to start the lighting and sound project. David Hoffert, a candidate for City Council District 13, which includes Edgewood, said while he hopes to see both sides work to find a compromise, the school’s decision to start games isn’t helpful. Hoffert, the DMNA president, said he was speaking on behalf of himself and not the association while he’s running for City Council. A compromise like allowing the school to have a few night games a year might be necessary to ensure the neighborhood is protected from further disruptions, Hoffert said. His opponent, Tag Evers, said starting games amid the stadium controversy doesn’t improve residents’ trust of Edgewood. We wanted to send an update in response to Edgewood’s assertion that they intend to install stadium lighting and sound outside of the City of Madison’s process to amend a campus institutional Master Plan. First, any installation of lighting will require a permit from the City of Madison. Last summer, Mike Elliott requested that former Alder Sara Eskrich sign off on stadium lights as a minor alteration. Alder Eskrich said that would not be possible as stadium lights would require an amendment to the Master Plan and referred him to city planning staff. Second, the wording of Edgewood’s Master Plan, negotiated with the city and neighborhoods, stipulates use of the field for Practices and Phys Ed classes only. The Zoning Administrator for the City of Madison offered his interpretation in November 2018 that Edgewood has been in non-compliance with their zoning by playing competitive games on the field. Further, he stated Edgewood could be subject to enforcement if they did not successfully amend their Master Plan. If Edgewood is not pursuing their amendment through the Plan Commission, they may be subject to enforcement for each game played. This includes the daytime games whose crowd noise has been disruptive to many neighbors. Finally, all of the sound studies performed, including Edgewood’s own study, show that even a relatively small crowd of 150 generates noise that exceeds Madison’s noise ordinance. Their subsequent proposal to build a wall would not mitigate crowd noise to levels conforming with Madison’s noise ordinance. Their announcement on Friday, February 22nd to get a permit to install a sound system and 80’ pole lights is an attempt to sideline neighborhood opposition and established city processes. We appreciate the efforts of Madison’s City Planning Department staff thus far, as well as the effective representation that incoming DMNA President Rachel Fields has shown throughout this process. As this situation unfolds, we may be best served by having our own legal representation. Please consider if you would be able to contribute to a legal fund in the near future. Thank you for your ongoing support and action to protect the quality of life in Madison’s near west side residential neighborhoods. Dear Editor: I am writing in response to a news report about the Edgewood stadium. The article reports on Edgewood HS’s communication to its parent and donor communities about their change in strategy to achieve their goal of hosting night games on their athletic field. As usual, Edgewood did not inform, much less seek the input of, the surrounding neighborhoods that would be most affected by this. Edgewood is not changing its end goal, they’ve just called a different play — a Plan B in which they build their stadium piecemeal through a process they believe will allow them to circumvent public input. Their Plan B presumes that city staff will ignore the Campus Master Plan, which does not allow the use of the athletic field for competitions. I have faith that the city’s professional staff are not bureaucrats with blinders, and will see this for what it is: an attempt to execute an end run around an open process, in order to advance Edgewood’s interests while disregarding and devaluing the negative impacts on surrounding neighborhoods. I am on the steering committee of No New Stadium. I'm a 36-year resident of the Dudgeon-Monroe neighborhood on Madison's Near West Side. My daughters attended Edgewood Campus School, Middle School and High School. My sad realization is that the current Edgewood administration is a far cry from the leadership of the past. The suggestion that Dominican values are being upheld is not true. Truth has been compromised in Edgewood’s misrepresentations of need, intent and project scope. Compassion is absent in a revenue-producing project that results in lost property values for nearest neighbors. There is little justice when leaders and students live elsewhere, and our neighborhood must deliver the goods. Where is the partnership when our very self-respect is called NIMBY? Imagine if Edgewood had called our community together and said, “We’re in a bit of trouble. Enrollment is down. Revenues are tight. We have a history of such great collaborations. Let’s work together to help Edgewood thrive!” Our neighborhood would have risen to an honest challenge because we don’t want Edgewood to fail. Instead, the current administration has presented a convoluted plan excluding true input. A long history of trust and cooperation has been sacrificed. In all of the discussion about Edgewood High School's proposal for a new stadium, one elephant in the room has been overlooked. Why should any significant investment be made in a sport known to inflict long-term brain damage in players? While the facility will be multi-sport, obviously football is the primary financial driver. The stadium will help Edgewood better compete for area students in a time of increasingly challenging enrollments. But well-established research shows football poses significant health risks that go beyond concussions to the repeated (and unavoidable) blows to the head. To put this in context: Throw on a helmet and hit your head up against a wall for eight weeks straight. Then imagine a brain still in its development. I say this as a parent of a former Edgewood student who received an excellent education. I say this as a former football player and once-avid fan: I cannot in good conscience support youth football knowing now the terrible risks. Twenty years from now, football stadiums such as these will be a negative symbol of an era not yet ready to quit an unhealthy addiction. I would counsel Edgewood to commit its resources to finding a worthier emblem of its academic excellence. Many neighbors have long opposed Edgewood High School’s contentious proposal to build a stadium with lights, seats and amplified sound. Chief among their complaints: Edgewood has said using the Middleton High School field is “no longer feasible,” and No New Stadium takes issue with that characterization, saying records show Edgewood could have continued to use the field. Email obtained via open records. “We did not have problems with them, actually it was a good arrangement. They are just wanting to get lights at their new stadium and the neighborhood doesn’t want that,” an October email from Middleton High School Athletic Director Bob Joers reads. Edgewood wants to replace 450 bleacher seats on its athletic field with a 1,000-seat stadium including restrooms, a press box and a concession area. The school plans to install LED lighting that would minimize “glare, light spill and sky glow” and a sound system that would direct noise into the stadium. Edgewood must amend its master plan to go through with the project. The amendment was originally slated to appear before the Madison Plan Commission on Jan. 14 and the City Council on Jan. 22., but on Wednesday, Edgewood requested that the project be referred to a later date. Many neighbors are adamantly opposed to the idea, which they say will disrupt the neighborhood. The Dudgeon-Monroe Neighborhood Association strongly opposes the proposal; the Vilas Neighborhood has voiced support for the project. “This is due not only to Middleton’s own athletic program demands, but financial ramifications, safety concerns and scheduling for Edgewood’s athletes. This fact has left Edgewood scrambling to find a location for ‘home’ games,” the proposal reads. “Edgewood has created this crisis, portraying their quest for a stadium as an absolute need when it’s simply something they want,” said Tag Evers, a spokesman for No New Stadium and a candidate for City Council. In a Tuesday Wisconsin State Journal article, Joers and Edgewood President Mike Elliott clarified that while Edgewood had the option to keep using the Middleton field, scheduling was becoming more difficult with Middleton’s increasing field use. This week, Edgewood proposed a compromise, some of which had previously discussed publicly, ahead of next Monday’s Plan Commission meeting. It would set a limit of 17 games ending by 8:30 p.m. and eight Friday night games ending by 10 p.m. It would further add a wall or berm at the end of the track to lower crowd noise and add visual screening, and clean up Master Plan language to explicitly allow for the field’s current uses. No New Stadium was unimpressed with these changes, saying in a press release that the wall would not do enough to reduce noise. “Unfortunately, what Edgewood needs is more land to accommodate their desired expansion and intensified use,” the release said. On Wednesday, the DMNA asked Edgewood to delay the project's appearance before the Plan Commission, which Edgewood did Wednesday afternoon. "In just the last few days, Edgewood has released a new sound study, a new environmental impact study, and a new proposal to add a sound wall to their proposed field improvements," a statement from Rachel Fields, vice president of the neighborhood association, said. "All of these were released after the public comment for the Plan Commission meeting had already ended. Simply for the sake of enabling our members to know what proposals are even being considered by the City, we called on Edgewood to ask for a postponement." Elliott was contacted for comment, and this story will be updated with any response. This story has been updated, as the project will no longer appear before the Plan Commission on Jan. 14. MADISON, WI. (January 9, 2019) -- Emails obtained via Open Records Requests reveal a pattern of bad-faith negotiating tactics and misinformation on the part of Edgewood High School with regard to its proposed Master Plan amendment. The proposed amendment, which will be reviewed by the City of Madison Plan Commission on January 14, would allow the private Catholic high school to build a 1,000-person stadium with 80-foot tall light poles and amplified sound less than 100 feet away from the nearest private residence. Open Records Requests have yielded numerous documents related to aspects of Edgewood High School’s proposal for a new stadium. Public-facing, open source information has also shed light on EHS’s proposal. Want vs. Need: Edgewood High School clearly wants a home stadium and argue they need a stadium by asserting it is no longer feasible for them to play their home schedule on Middleton’s field. This appears to be false. In emails obtained via Open Records Requests, Middleton officials indicate that EHS is welcome to continue the arrangement they had with Middleton. Crowd Noise Impacts: EHS’s second claim in support of a new stadium is that “technological improvements” will minimize the impacts of stadium sound, when there is no way to mitigate crowd noise. EHS included a discussion of crowd noise in their 10/17/18 public neighborhood presentation but then left it out of their proposal to the city to amend the Master Plan. Their proposal includes seven pages on lights but nothing on crowd noise, probably because Edgewood knows crowd noise will likely exceed allowable decibel levels in the city’s noise ordinance. Goodman Negotiations: It appears that Edgewood High School signed an agreement with the Goodman Foundation that stated the athletic field would be used by numerous outside groups, without receiving City and neighborhood association approval. Violations of Master Plan: Edgewood has been holding games and competitive sports events on the practice field, in non-compliance with the Master Plan, which is documented in EHS’ 2016-17 and 2017-18 reports to the Goodman Foundation. As a consequence, EHS has run afoul of the city, as attested by City of Madison Zoning Administrator Matt Tucker’s email to EHS after their 10/17/18 public, Foley & Lardner’s response, and the city's response indicating its disagreement with F & L's position. Intentions for Field: In June 2015, Edgewood High School claimed that they were upgrading the field for practices and Phys Ed classes only. However, a 6/15/15 WSJ article entitled “Edgewood breaking ground on $1.5 million athletic practice facility” quoted EHS Mike Elliott saying, “‘We’re between two neighborhood associations. They have been vehemently opposed to us having lights or playing games here,’ he said. ‘We’re really building this to be able to give our athletes the practice facilities that provide the best surfaces possible and to expand the amount of outdoor practices we can hold especially in the spring. That is our focal point.’” At the same time, Elliot was negotiating with Goodman for a gift that would require the field be used for games and community events. Number of Events: Edgewood has provided misleading and unclear information in their communications to the public, not acknowledging that they plan to host any number of daytime games and events with amplified sound, plus lighted practices until 7p.m. on a consistent basis. They have not been clear about the actual number of events they plan to host in their proposed stadium. Misrepresenting their dealings with the neighborhoods: The publicity items Edgewood has been sending out regarding the stadium give the impression that Edgewood always works with the neighborhood in their decisions, but at both the neighborhood information sessions in 2017 and 2018, the overwhelming majority of neighborhood speakers opposed a stadium. Despite this, EHS has largely ignored neighborhood concerns. Attempts to reach out to Mike Elliott by Rachel Fields, Dudgeon-Monroe Neighborhood Association Vice-President, have gone unanswered. Misrepresenting WIAA Rules: EHS cites WIAA regulations that Friday night games with lights are obligatory, but they are merely customary. EHS also claimed in the public meeting that WIAA mandates 1,200 seats for a stadium but then downgraded the number to 1,000. WIAA in fact only requires 1,000 seats for playoff games. Edgewood is under no obligation to build a stadium with 1,000 seats or to have lights. 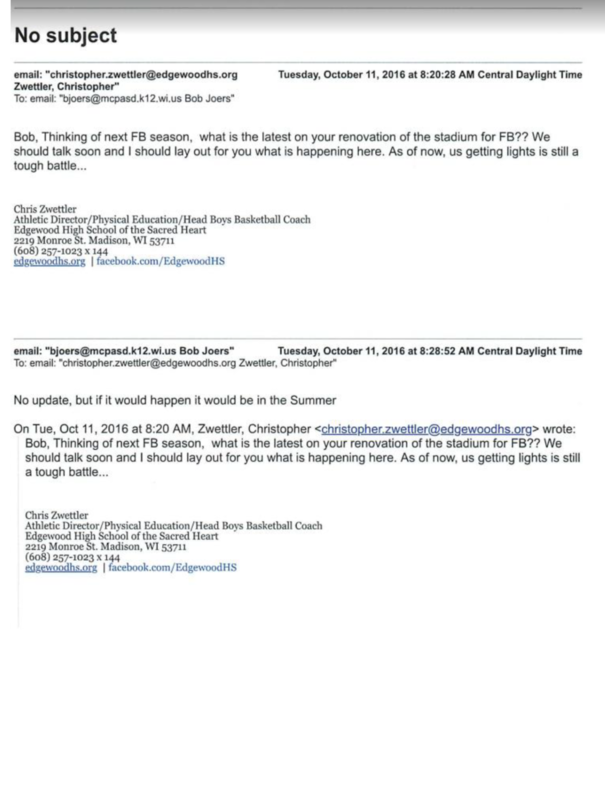 Inappropriately Trying to Influence Alder Sara Eskrich: Claiming he was “in a heap of trouble” from parents because the school had not yet scheduled a home game for Senior Night on October 5, on Thursday, July 26, 2018, Edgewood High School President Mike Elliott asked former District 13 Alder Sara Eskrich to help get City approval to host a football game on the existing athletic field, with “temporary lights and sound” and sign off on a minor amendment. Eskrich responded on July 27, “I cannot sign-off on the stadium lights as a minor alteration because we’ve discussed, very publicly, that this requires a master plan amendment.” Elliott made this request after learning of neighborhood opposition to the stadium, knowing that this was not permitted by the Master Plan. Dear Editor: I am writing in reference to the article "Explained: Compromise proves difficult in Edgewood High School stadium standoff." I am a 30-year resident of the Edgewood neighborhood and own a business on Regent Street. I have a strong commitment to helping ensure that this truly wonderful community continues to thrive. Change is inevitable and we are already seeing it on Monroe Street with new multiuse buildings and businesses coming in. This will enrich livability and add to what is already a very vibrant part of the city. What distresses me is Edgewood High School's persistence in trying to make a change that will largely benefit people outside the immediate area while negatively impacting those right here. We live in a society where we value the right to do as you wish within the confines of one’s own property, but we also have a collective agreement that this right does not trump the responsibility to do no harm to one’s neighbor in the process. The thought of nonstop amplified sound and crowd noise that will not be able to be moderated terrifies me. We will be subjected to this on an almost-continuous basis. Games being played not only by EHS teams but various other outside entities three seasons of the year will mean constant disruption. Edgewood has asked for our support and understanding, but where is their regard for us? Trying to reach a “compromise” is absurd. What a compromise will mean is one foot in the door leading to what Edgewood really wants: full rein to do as they wish. Build it and they will come — and what will be lost to the neighborhood character and those of us with homes within yards of this stadium will never be recovered. Dianne Jenkins, Wisconsin State Journal. The State Journal editorial board stepped into the Edgewood High School stadium debate Wednesday, framing the issue as “Let the kids play under the lights.” But the editorial missed the broader story. Yes, it is about the kids. But it is also about the money, particularly Edgewood High School’s need for new revenue streams, and it’s about protecting the livability of a city neighborhood. According to a UW-Madison Applied Population Laboratory report, the number of Wisconsin high school graduates has plateaued, which is bad news for private schools that compete for students. In 2009, the number of Wisconsin high school graduates peaked at about 70,140, declined 7.6 percent to 64,803 in 2016, and will not increase until 2026, to 67,000. The impact on private school enrollment of this population decline and plateau is obvious at Edgewood High School. In the 2014 Campus Master Plan, Edgewood High School reported 593 students in 2012 and projected 650 students by 2022. Instead, its enrollment has declined, to 487 in 2017. At a stated tuition of $11,345, the 18 percent decline in enrollment represents an annual $1.2 million budget shortfall needed to pay operating expenses. One new source of revenue was achieved in 2015 when the Goodman Foundation generously donated just over $1 million to build a new “sports complex” for the high school, with a requirement that it also serve the community. To the neighborhood’s increasing concern, the high school reported 22 unaffiliated groups used the sports complex in 2016-2017, and 21 in 2017-2018. But the high school’s approved use for the sports complex, codified in the Campus Master Plan, is to host team practices and physical education classes, not competitions. The high school has violated its master plan agreement by hosting youth soccer, lacrosse and private grade school games, as well as UW teams and others. So the issue is not just crowd noise and accompanying eight-story lights for a handful of night games. The high school will want to expand the use of a sports complex for the badly needed rental income, and to fulfill its community use agreement with the Goodman Foundation. Edgewood High School has placed itself between a rock and a hard place. It agreed with Goodman to increase field use, while overlooking its responsibility to first obtain approval for such use. If this use is approved, the economic odds are in favor of Edgewood expanding further, whatever the conditions. This sentiment is felt throughout the neighborhood as exhibited by the Dudgeon-Monroe Neighborhood Association’s 18-to-1 vote in opposition and subsequent opposition to the City Council member’s proposal. Unlike the previous 16 campus projects it supported, our neighborhood association opposes this one because people living across the street in the neighborhood, on two sides of the proposed sports complex, will bear all the negative impacts of such use. Jenkins is a Dudgeon-Monroe neighborhood resident on Madison’s Near West Side and a member of No New Stadium, a group of neighbors and others who oppose the Edgewood High School stadium proposal: nonewstadium.org. MADISON, WI. (December 13, 2018) -- In response to Interim District 13 Alder Allen Arntsen’s short-term, five-game solution to Edgewood High School’s proposal to amend its Master Plan and build a 1,000-person stadium with lights and sound, neighbors warn that building a new stadium still poses a serious long-term threat to livability and urban greenspace. Grassroots neighborhood group No New Stadium remains opposed to Edgewood High School’s proposed amendment to its Master Plan to allow for the construction of the new stadium. In publicity materials and news interviews, Edgewood High School has claimed that the impact of its proposed Monroe Street stadium would be minimal, since there is a technological fix to the sound and light problems, but nearby neighbors already experience high levels of noise from the existing new field inside their homes, with the windows closed. Since there are no city ordinances that relate to crowd noise, any complaints of violations are unenforceable. The neighborhood has long been overwhelmingly opposed to a stadium on Edgewood’s Monroe Street campus. The existing state-of-the-art athletic field, which was built in 2015, is the result of a 2014 compromise between the Dudgeon-Monroe Neighborhood Association and Edgewood High School. Nevertheless, during the past two years, Edgewood High School has allowed games and competitive events to be held on the field, in violation of its current master plan. No New Stadium is a grassroots organization of neighbors who oppose Edgewood High School’s proposal to build a stadium with lights and amplified sound on its Monroe Street campus. The group was formed in October 2018. The Monroe-Vilas area provides a model balance of commercial vibrancy, greenspace and peace. This balance is an asset we wish to defend and preserve. Learn more at nonewstadium.org. Listen as WORT news director Molly Stentz takes a close look at Edgewood High School's proposed Goodman Athletic Complex project. She is joined in the studio by Josh Napravnik from the Dudgeon-Monroe Neighborhood Association, which recently issued a letter declaring their opposition to the project. Madison residents weigh in on how the new stadium—and similar development projects throughout the city—could affect the broader community. This letter was submitted to the City of Madison Plan Commission on October 31, 2018. We are a grassroots group of concerned citizens that formed after the public meeting held at Edgewood High School on October 17, 2018. We strongly oppose Edgewood’s recently unveiled plan to turn its new athletic field into a stadium with 1,200 seats, 80-foot high-mount night lighting and an amplified sound system. We respectfully request that you circulate this letter to the members of the Plan Commission prior to the November 5, 2018 meeting. A Dudgeon Monroe Neighborhood Association survey in April 2017 showed two-thirds of respondents were opposed. Recently, David Hoffert, president of DMNA, stated that since the 2017 survey, “the rough breakdown of two-thirds opposed and one-third in support has [not] significantly changed” (Capital Times, 10/16/18). Edgewood claims that neighbors would be largely unaffected because it has a technological fix for the livability problems of bright lights and noise pollution. We believe these claims are unproven. For example, data gathered by Ethan Brodsky, a Dudgeon-Monroe resident who has a PhD in Electrical & Computer Engineering, at a Waunakee High School football game, call into question the low decibel figures and mitigated light-spill claimed by Edgewood’s vendor. However good the technology, if this stadium is built, there will be additional noise, light and traffic, and increased use over time. 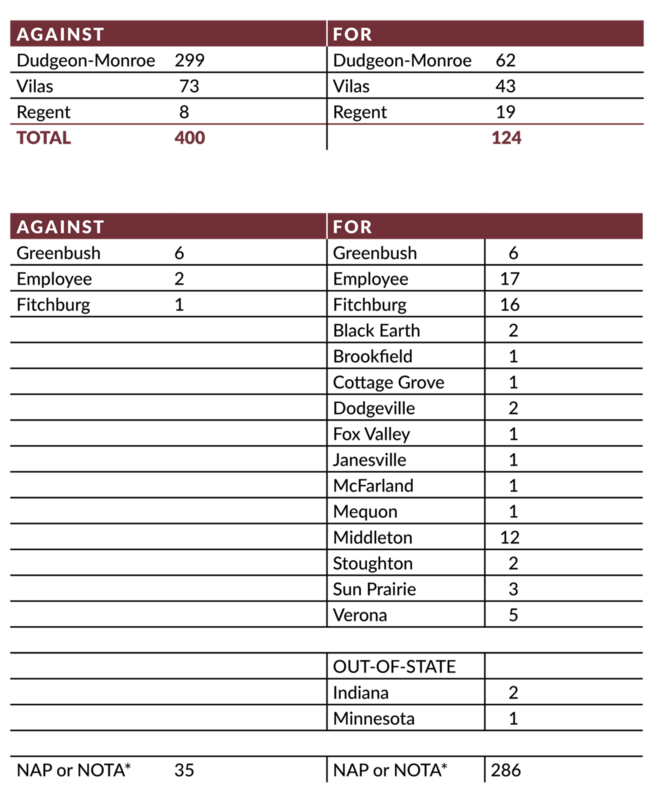 The Campus Institutional Zoning District ordinance Statement of Purpose (sec. 28.097 (1)(c), MGO), says that Campus Master Plans should “balance the ability of major institutions to change … with the need to protect the livability and vitality of adjacent neighborhoods.” There are two criteria listed in the CI Zoning Standards for Master Plan Approval by the Common Council (sec. 29.097 (6)(a) & (b), MGO). The first is that “the Plan shall serve the public interest as well as the interest of the institution developing the plan.” The public interest in reasonable peace and quiet currently cherished by nearby residents would not be served by a continuous series of events punctuated by a play-by-play announcer, pep bands, and crowd noise. This would profoundly change the neighborhood’s essential fabric as a quiet, friendly residential community. The impact to the adjacent neighborhoods will be decidedly negative, with spillover effects on recreational use of Lake Wingra, traffic issues on Monroe Street and neighboring streets, and a tragic breach in relations between Edgewood and its neighbors. The second CI zoning criterion is “the Plan shall be consistent with the goals of the Comprehensive Plan and adopted neighborhood, corridor or special area plans adjacent to campus boundaries.” The Edgewood proposal is inconsistent with the Monroe Street Commercial District Plan, adopted by the City on March 3, 2007. One of the stated Commercial District Plan goals is “to preserve and enhance the residential character of the neighborhood around the commercial districts” (p.9). With respect to Edgewood specifically, the Plan states that “Edgewood . . . is an important presence on Monroe Street. . . . [It] will be critical for any future plan to carefully coordinate with surrounding neighborhood and land uses to avoid any negative impacts” (p.43). Moreover, to the extent that a Conditional Use Permit may be required, such a major amendment could not be approved under sec. 28.183(6)(a)3., MGO, because the “uses, values and enjoyment of other property in the neighborhood for purposes already established” will “be substantially impaired or diminished” in a very foreseeable manner. Even if not directly applicable, this standard provides helpful guidance as to what is in the public interest as related to substantial alterations of a CI zoning district Master Plan. When Edgewood’s request to amend its Campus Master Plan in order to build this stadium comes before the Plan Commission, we will be asking the commission to hold Edgewood to current standards (both those we have referenced and others), reject the request, and protect the adjacent residential neighborhoods. As stated in the city’s Comprehensive Plan, “Neighborhoods are the basic building block of the city“ (p. 46). We have provided this early communication to let you know how strongly we feel about this, and how committed we are to protecting the quality of life of our community.